I’ll admit it… I am usually not a big fan of can lighting. But I take exception in this case. 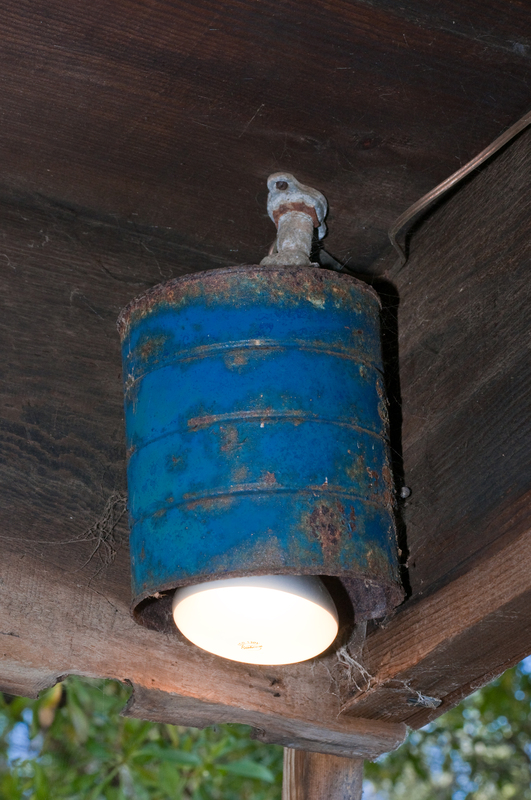 This is an old coffee can… opened on both ends and then spray painted blue. It is screwed to the wood… surrounding a galvanized exterior light socket. The astute amongst you will have noted that the wiring is actually speaker wire. ( I don’t recommend this) This lamp was built circa 1967 by a Cal Poly Architecture student named Todd Stoutenborough. (now he designs colleges and office parks… I wonder if he misses building lights out of scrap). I’m gonna call this style “hippie minimalist”. Most hippie architecture is just scrappy… but this particular piece was actually pretty cool back in the day. Now however… 44 years later… it is looking a tad saggy and rusty around the edges. Probably time to get a new can at least.. and maybe some regular wire. You can build this yourself…The can is free… the wire you can swipe from something else probably…. and the galvanized bits are probably less than 12 bucks at the hardware store. Spray paint is around 6 bucks. I can visualize this project in an old issue of popular mechanics back in the day… but today I suppose it would be in “make” magazine.